Working best in arts and media-focused teams, I bring my 5+ years of experience of implementing collaborative media projects, conferences, speaking tours, and film productions. As an accomplished community leader, I have experience planning and executing over 45 unique events and managing project budgets exceeding $50,000. virgins! is a comedy series that follows four 20-something-year-old women as they awkwardly navigate adulthood as millennials and love & relationships as virgins. 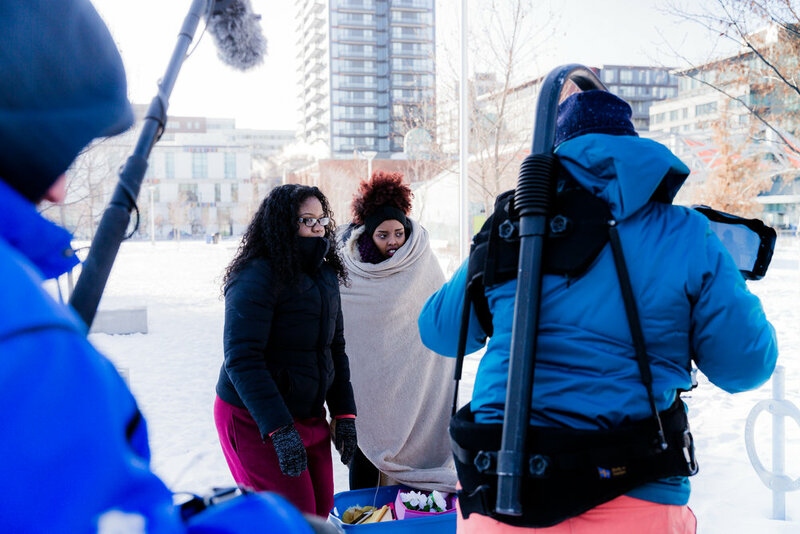 Set in the multicultural hub of Toronto, Canada, their experiences are contextualized through their cultural duality as East Africans – Ethiopian, Eritrean, Somali & Sudanese – and Canadians. The Behind the Dust series is a portal into a world that is curated and created by Women of Colour, showing the possibilities of imagining beyond convention, and â€œbehind the dustâ€ of inflammatory and one-dimensional portrayals of communities under fire. As a collective, the media-makers are Muslim, Indigenous, Black, Women of Colour conveying in-depth visual stories about their communities, celebrating the fullness of experience in all its layers. What does it mean to visiblize these experiences? How are we learning from the past and creating for the future? Creative Connect (CC) is a professional development project for early career artists seeking capacity building and career opportunities in the creative business sector. The project utilizes a customized approach to the development of mentorship opportunities, apprenticeships, job shadowing, income generation and internships in creative fields. Participants combine a diverse range of professional development opportunities with professional workplace experiences and mentorships from workplace professionals in the creative fields. The Turning Tables tour is designed to bridge the gap in accessibility between Indigenous Youth and role models like Joshua DePerry, aka Classic Roots, an up-and-coming music producer and DJ who blends Indigenous sounds with modern techno and house music. The communities we intend to visit include remote areas with lack of resources such as Webequie, areas suffering from mass youth suicide such as Attawapiskat, as well as a number of First Nation reservations who have expressed interest in hosting Classic Roots but have not had the funds available to make it happen. Bringing subjects from the film specifically to these communities to speak further than the film and engage directly with these youth will provide a deeper connection to the underlying message - that dreams are attainable and there is support to achieve them. The Turning Tables Tour is designed to address four key objectives; to strengthen Indigenous culture and community, inspire creative confidence, create a positive environment for youth, and encourage self-expression. We intend to reach these objectives through various art-based workshops, including film, photography, music and dance. Leaving Evidence is a multi-disciplinary community archiving program of The People Project. Leaving Evidence is a collective of Queer & Trans grassroots artists (predominantly self-taught, community educated artists) 29 and under, each skilled in one of our identified mediums (I.e. video editing, sound production, etc. ), and all are interested in expanding their repertoire by learning from each other. Leaving Evidence gives each artist the opportunity to explore and be mentored new art practices. Individuals in the group are both professional artists and community members, depending on the context.